If you are in the construction business or need a new tool that can help identify structural foundations and see through liquids, then this new sensor is an absolute must have. 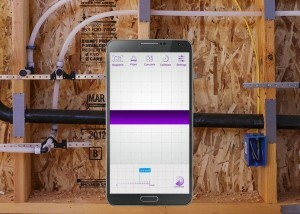 The WalabotDIY is a new 3D-vision smartphone compatible sensor that will let you see inside your walls and detect wires, studs, pipes, plastic, rodents and anything else that would get in the way of your project. Instead of holding two devices the WalabotDIY magnetically attaches to the back of your smartphone so you can use it single-handedly, leaving your other hand free to operate its app’s interface. If you have ever wondered what was on the other side of your wall or needed more of a visual before you started your next project, then this new 3D-vision smartphone compatible sensor is perfect. The device is the first to make Vayyar Imaging’s 3D sensor technology available in a consumer-friendly product that doesn’t require any training to use. You just need to download the WalabotDIY app from the Google Play Store, connect the accessory to your smartphone’s USB port, and hold it against a wall. Unlike a stud sensor, which lights up a series of vague LEDs to indicate when it’s detected an object or wiring behind a wall, the WalabotDIY app gives you a more visual representation of what’s been detected, its orientation, what it’s made from, and how far away it is, to a depth of about four inches. If you’re doing home renovations, and don’t want to make even more work for yourself when you cut into a wall and accidentally sever a pipe, the WalabotDIY’s $200 price tag actually sounds quite reasonable. It’s not as cheap as a basic stud sensor, but think of it as added insurance that a DIY project will be completed on time because you know what you’re dealing with before demolition gets under way. For more information on measuring for insulation or if you would like to start a new project of your own contact USI online to find a branch near you and get a free quote. USI believes in excellence in every step of the process and ensures timely completion and quality of service, time after time.